Michigan State volleyball play-by-play broadcaster John Kreger was named best college volleyball broadcaster in America today by the American Volleyball Coaches Association. 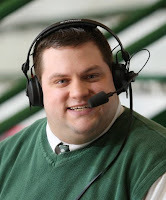 Kreger, the voice of Spartan volleyball since 2001, was picked as a finalist for the association's Grant Burger award, which honors the top person in volleyball media that year. The top sports information director, print writer, broadcaster and online writer in the land vie for the award - with Kreger picked to represent broadcasters. "Obviously, we are very excited for John, he is an avid Michigan State volleyball fan, but more importantly he truly cares about the game of volleyball at all levels," said head coach Cathy George. "I have had the privilege of working with John for the past 4 seasons and am amazed at his ability to depict such a vivid and accurate image of our sport with his words." "There is never a moment during a broadcast where listeners are left without details of where the ball is, who recorded the kill, who posted the dig or even what play was run," AVCA officials said in a statement. "Kreger also institutes detailed interviews with both of the matches head coaches in to his match-night broadcasts and is an avid blogger, all helping to take the promotion of the sport of volleyball to new heights." Will Tieman, president of the Spartan Radio Network and voice of MSU basketball, agreed. "John possess a passion for the sport which he artistically conveys during his broadcasts," Tieman said. "He is more than deserving of this award." Full disclosure here: Both TOSSS authors know Kreger on a personal and professional level, but I'd be singing his praises even if I'd just heard him on the radio. My favorite Kreger broadcasting story comes from this past year, when Kreger covered MSU's historic victory over the University of Delaware live from a creaky old fieldhouse in Newark, Del., the roof of which couldn't stop the rain from the remnants of Tropical Storm Hanna that was raging around outside. Water dripped from the roof so much that play had to be halted after every few points to mop up the floor. His commentary bench was on the floor, set off to the left of one of the court sides and partially behind a team bench. Easily the worst spot one could have to call a game. Yet Kreger didn't miss a beat, his voice crescendoing with every Spartan point as he masterfully narrated Michigan State's most dominant set win ever - a 25-8 shellacking to cap a straight-sets victory over the Blue Hens on their home court. "He is passionate, hard working, and carries a genuine excitement for MSU and Big Ten Volleyball," George said. "He is an integral member of the Spartan family, but to say that he only represents our conference would be an understatement." Amen to that, and our hearty congratulations to one of MSU's finest.